There’s nothing quite like a HUSS Break Dance ride. Almost certainly Germany’s answer to the Waltzer, Break Dancers are not hard to find in mainland Europe. 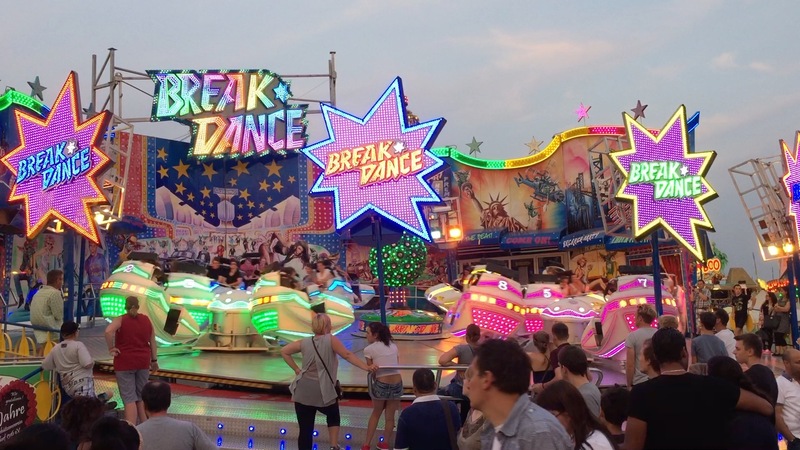 We’ve been over to the Düsseldorf Rheinkirmes to ride Bruch’s impressive machine. Built in 1990, Bruch’s Break Dance is one of the smaller four-arm models of the ride from manufacturer HUSS. It features 16 cars and holds up to 32 riders at a time. Under the control of an experienced operator, Break Dancers are utterly brilliant to ride. The ride’s main platform and four arms can be independently controlled to give fast bursts of speed, and the cars can be locked and unlocked to allow for precise spinning. The video above shows Bruch’s machine with Tom von Furth at the driver’s seat. A member of our group is friends with Tom, so we ended up with this extra-long ride with some personalised interaction over the PA system! Having ridden a few Huss Break Dancers it’s hard to understand why they were never a big success here in the UK. Whilst we have had a few non-Huss versions over here they have never attracted the same amount of attention that they respectively attract overseas. Oh well, maybe this will all change if and when Break Dance UK opens! Tags: Europe, Flat Ride, On Ride, Single Ride, Thrill Rides, Videos.